Chimpanzees are born at a weight of approximately 4 pounds and but as adults reach a weight that is usually between 95 and 150 pounds (Sheila Clark), but in some case they can exceed 200 pounds. Their bodies are covered with black and brown hair, but their faces are hairless (big zoo). They can have grey especially on the under chin area of older males (which can live to be 35 - 45 years in the wild and as long as fifty in captivity) (SCZ). In addition they have large external ears (big zoo). Chimpanzees arms are unusually long; they are 50 % longer than their body (big zoo). Chimpanzees also have opposable thumbs. Chimpanzees are very social animals and usually live in groups of between 20 and 80 animals. Each group tends to have a dominate male and to a lesser degree a dominate female, but it is common for this hierarchy to change. With in the groups subunits are devised for hunting and gathering. 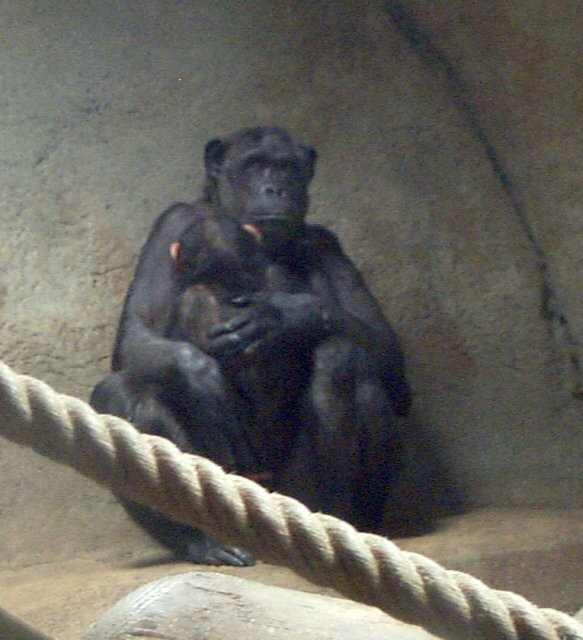 Young are weaned at approximately five years of age (big zoo), and are often cared for with the help of other female relatives. Perhaps, because these groups are large and the leadership is fluid, a considerable amount of time is spent reinforcing bonds by grooming and in the case of some subspecies with sexual acts. They use facial expressions, vocalization and gestures to communicate. 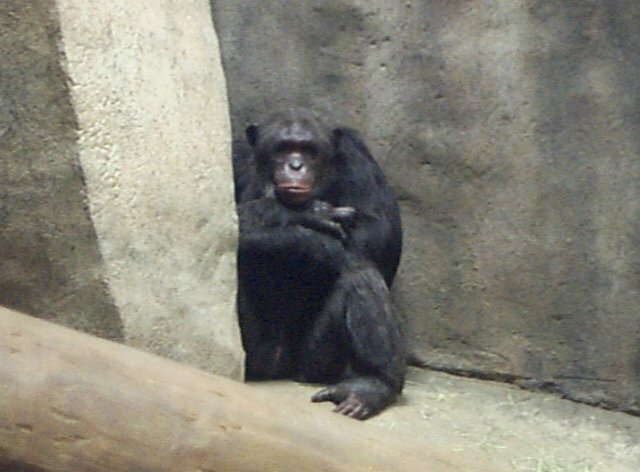 Chimpanzees are also highly hostile to other groups. The Chimpanzee is known for it's use of tools which is most commonly seen being demonstrated as the chimpanzee uses a stick to extract termites from their mounds; they do however use tools in other manner as well. This is not an instinctive behavior and must be taught to their young. Chimpanzees build nest of tree limbs, leaves and brush to sleep in at night. Although, some choose not to build and steal their nest from another chimpanzee. Females come into estrus for the first time at age 8 or 9 but are not the older males are not usually attracted to them until they are 10 or 11 (probably because they are not fertile until this time). Once a female gives birth she will usually not do so again for about 5 years, unless her infant does not live . The males are apparently more attracted to some females in estrus than they are to others. All of the adult males may pursue a female and sometimes even with adolescents and juveniles following along. However, the dominant male may try to keep her to himself and try to keep others away from her. In addition lesser males sometimes persuade a female to accompany them to an outlaying area of their territory where they try to get her to stay until the end of her estrus. In this way even the low ranking males are capable of fathering young (Goodall). 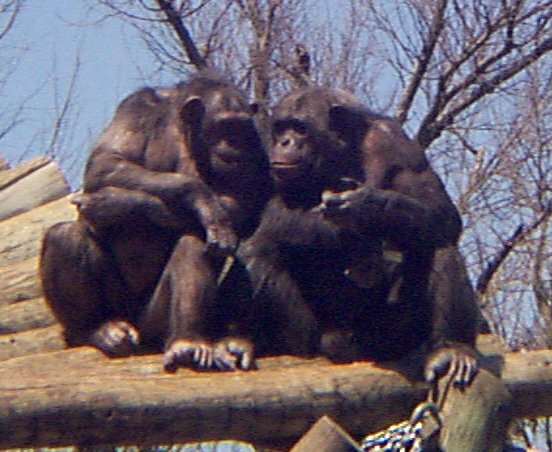 When I observed the Chimps at the Fort Worth Zoo, they were originally not interested in the audience and seemed somewhat lethargic. For the most part they were just sitting around. However, I returned to find them in different spirits. They seemed to be attempting to entertain the audience by jumping and swinging around. Anything that people particularly enjoyed the chimps seemed to repeat. I guess you just have to catch them at the right time of day.